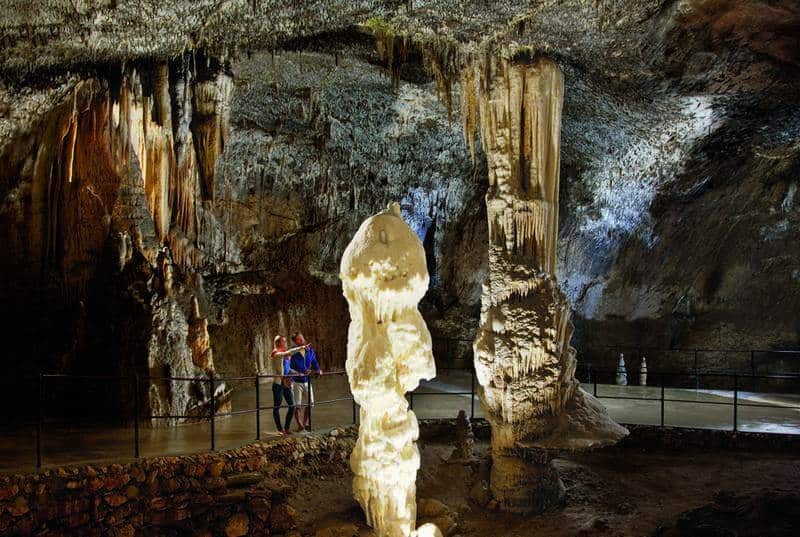 The Postojna Caves is the largest cave system in Slovenia with over 21 km of passages, galleries and halls. The caves have been open to the public for over 200 years, making it one of the first caves to be turned into a tourist attraction. I’ve never been one for going underground. I find spaces like that claustrophobic and I’m constantly worried that the ground above or below is just going to give out resulting in me being crushed to death with no way of escape. Over active imagination? I think so. My friends wanted to go so I put on my big girl pants and went along. If travel isn’t for challenging oneself then you might as well just stay at home. I had a fantastic time exploring the caves and I didn’t feel claustrophobic at all (okay, maybe a little at the beginning. It was a bit disorienting and so dark inside, but it was fine after a minute). Some people said that the caves looked too touristy and a bit tacky, especially with the advertised train ride. I didn’t feel it was at all. The train is only there to take you from the entrance into the cave where you get to walk around. Once you get into the main part of the cave, they break you up into smaller groups with tours in a variety of languages. Even though you’re in a smaller group, I still found it difficult to hear my guide. The chambers are large, sound just gets lost and there are so many other groups with different languages that you can’t help but overhear. I was there in the off season so I can’t imagine what it would be like in the summer. Looking up at the Russian Bridge that connects two parts of the cave. Thanks to elementary school geology classes, while wandering around, I successfully remembered the difference between a stalactite and a stalagmite. Stalactite has a c in it for ceiling and stalagmite has a g in it for ground. Simple! 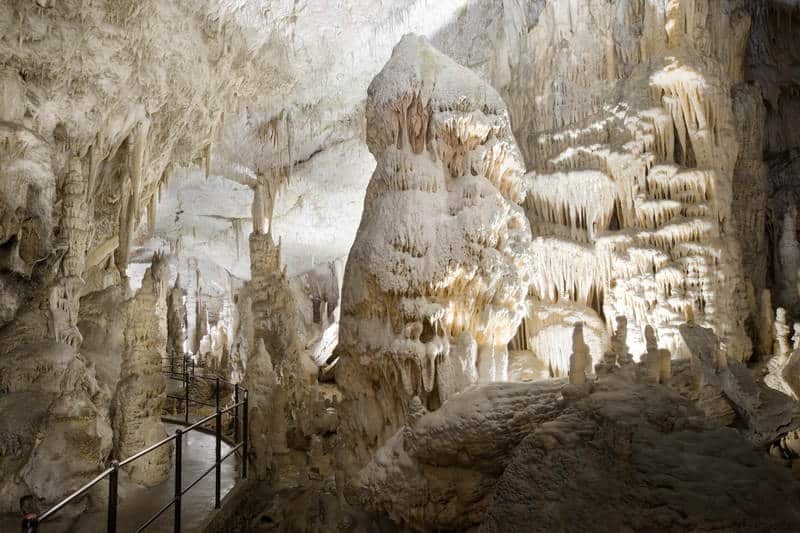 The most famous stalagmite inside the caves is called the Brilliant. It stands at 5 meters tall and is so shiny and so white. No wonder they gave it that name. This stalagmite stands underneath a consistent and even drip from the ceiling which gives it that beautiful shiny white colour. Did you know 1 mm of stalactites takes 10 years to form? One of the many cool facts you learn on the tour. It really makes you appreciate how old these caves are. My favourite room was the White Hall. Look at it. It’s gorgeous. Everything is beautifully white from the pure calcite. 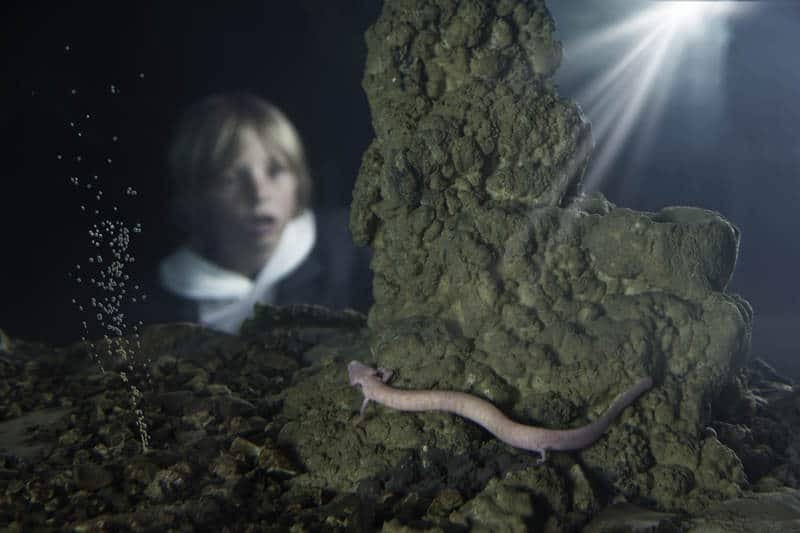 The caves are also home to the human fish or the olm (proteus anguinus), the largest troglodytic amphibian in the world. These blind amphibians get their nickname from their human coloring. It is a neotenic animal which means, despite looking like a baby, the animal actually has adult-like functions. They can grow up to 16 inches long. They look a bit creepy to me! The coolest part was being able to send postcards from the 112 year old underground post office. Seeing how much I love sending postcards, I was all over this. Postcards for all! The post office was located inside the room they call the concert hall. With a massive ceiling, perfect for acoustics, they occasionally hold concerts inside. That would be a fantastic way to spend a couple of hours! I thoroughly enjoyed my time at Postojna and would love to explore the nearby Skocjan Caves the next time I’m in the area. I didn’t feel claustrophobic and my worries were for naught. Maybe one day I’ll be brave enough to try some caving! Have you been inside a cave? Did you enjoy it? All photos inside the cave were provided courtesy of Postojna Caves. Photography is not allowed inside. The full tour lasts about 90 minutes. Tours run every hour on the hour during high season with less tours during the off season. The caves are at a constant temperature of 10 degrees so dress appropriately. Be sure to wear closed toe shoes that you can walk easily in. If you’re new to Pack Me To, welcome! Stay on top of my adventures on Facebook and follow me on Twitter & Instagram. One of the real highlights of Slovenia. Caves can be wonderful things to explore – I agree, they really arent that ‘touristy’, I’ve visited a number of caves in Asia – principally in China and Vietnam, where everything is lit with strong colours and the like and they ARE made to look very touristy, but these ones, as I remember, were not. great post, I think if you’re in Slovenia then this is a must see. Thanks for sharing, and nice pics. Getting good pics underground is always a challenge! Thanks Andrew! I haven’t been to any of the caves in Asia yet so it’ll be interesting to compare the two when I do go. I felt these guys were respectful of the area while providing an immersive tour experience. I wish I could take credit for the photos, but they were provided by the caves as you’re not allowed to take photos inside. What fun! I love cave tours. I would also love to send post cards to my friends from the cave! It is a pretty cool place to explore. I hope you get a chance! Thanks Bron! It really is a great cave to visit. I wish I could take credit for the photos, but they were provided by the caves as you’re not allowed to take photos inside. These look absolutely gorgeous! I haven’t gotten to visit a cave in a long time – makes me think I should get on that. They were so cool! Sometimes we get so caught up with things on the surface of Earth that we forget what is underground. Pretty cool stuff. I cried before entering these caves. I have a fear of the dark and enclosed spaces. But I sure was wowed when I entered – so great to see your photos and be reminded. Aww SJ 🙁 I hope it wasn’t too traumatic for you and good on you for overcoming fears. This looks AMAZING!! I’m really fascinated with caves for some reason (even though I’ve yet to see a real one). The picture of the White Hall looks so gorgeous! I think I’m even more convinced now that I need to go to Slovenia. Yes! You need to go to Slovenia. It’s super gorgeous and the white hall is unreal. These caves are amazing. I too have a fear of being crushed and buried alive in small caves but I think I’d be OK here as they’re so big. The white hall looks completely surreal. Yes, agreed. These were really wide and open so not too much fear of it closing in on you which is nice. I remember visiting Postojna as a child and liking it sooo much… I guess I must repeat the experience soon! Great post! Thanks Margherita! I hope you get a chance to return to Postojna! Yet another reason for me to visit Slovenia. My best caving adventure was in Belize, you swim into the cave then hike about a mile in to find Mayan artifacts left the way they’ve found them! Very cool. Oh wow, that does sound very cool! I would love to do that one day. I’m sure I read about these recently, and…. it sounds awesome and stuff, but. Caves scare me. My Dad used to go potholing when he was younger and his tales of being underground freak me ouuutt! Yikes! Well these were very safe and there were always lots of people. They’re probably less creepy compared to some of the others in the region where I’ve read you’re on your own with a headlamp. Those would freak me out I think. It does sound like quiet guides are a problem all across the world haha. I would love to see the caves in Vietnam one day. I wonder if the concerts in there are also echo-y or if the novelty of being in a cave is the main appeal to attending a performance there. I would definitely be interested in touring this place, especially if I could easily hear the guide. Brilliant is indeed brilliant, and I agree that the human fish are creepy. I wonder that too, but then I think of concerts in big churches and those don’t seem very echo-y. Either way the coolness factor of attending a concert in a cave is sure to outweigh any bad acoustics. I had the same struggle, but went with these ones. I definitely want to go back and see the Skocjan caves next time. Oh gosh, that would be my worse nightmare. I don’t think I could handle that and probably have a panic attack right in the middle of the cave. No thank you. No wonder it has scarred you. Thanks Calli! I’d be interested to see the Skocjan caves now that I’ve been to these ones. There are plenty of other ones to explore as well in the area it seems. These look like fun caves to explore…except for the creepy-crawly…yuck! Yup, I was glad there was a thick piece of glass separating me and it. I can’t imagine coming across it in real life. I’d be too creeped out! That train ride looks like a great start to the tour. And those stalagmites must be even more wonderful in person. I wouldn’t be surprised if locals head down there on a hot day, just to have a 10-degree environment for an hour and a half. It would be a nice break from the heat of summer for sure. The caves were so much better than the pictures for sure. We love exploring caves and I’m glad you got to explore this beautiful cave. Wow, that Brilliant and White Hall are just stunning. Slovenia never ceases to amaze me. I’m with you on that creepy fish. Definitely – these caves are absolutely stunning and awe inspiring. Definitely worth exploring. If I can do it, so can you! It was a lot taller and wider than I thought so it really wasn’t too bad once you got acclimatized. 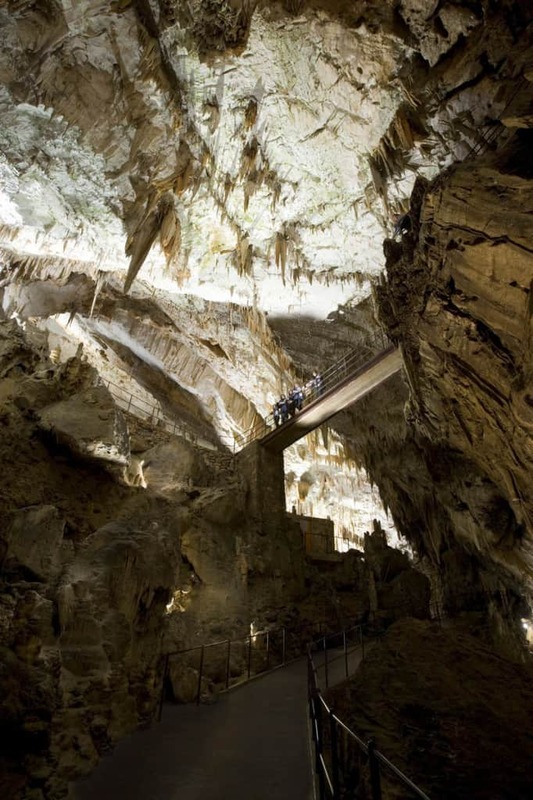 Great post on Postojna Caves! I am a bit like you when it comes to enclosed spaces. I simply don’t like to go underground. However, I’ve been to Postojna couple of times (and actually loved the train!). Covjecja ribica (that human fish) is spooky. Thanks Anda. I would love to be able to attend a concert in the cave as well. It would be fantastic. I wish I could take credit for the image, but I wasn’t allowed to take photos inside the cave. 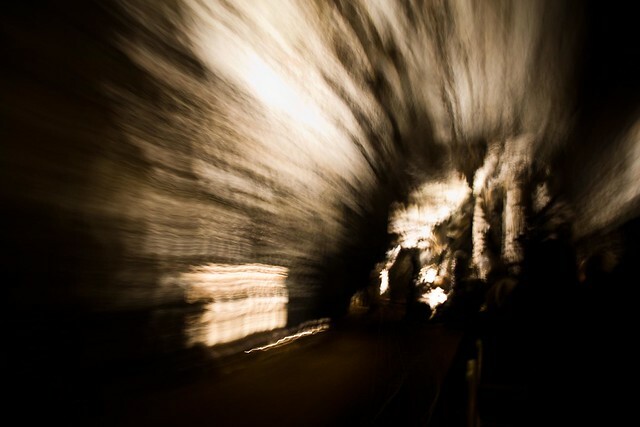 All these photos are courtesy of Postojna Caves.